My first update and I'm doing so much better than I thought I would be a month ago. The year started out pretty slow. My first trimester was still bringing me down in January and all I could manage to read was the same Harry Potter books I've read multiple times before and I was worried my update would be so sad and pathetic. But not so! 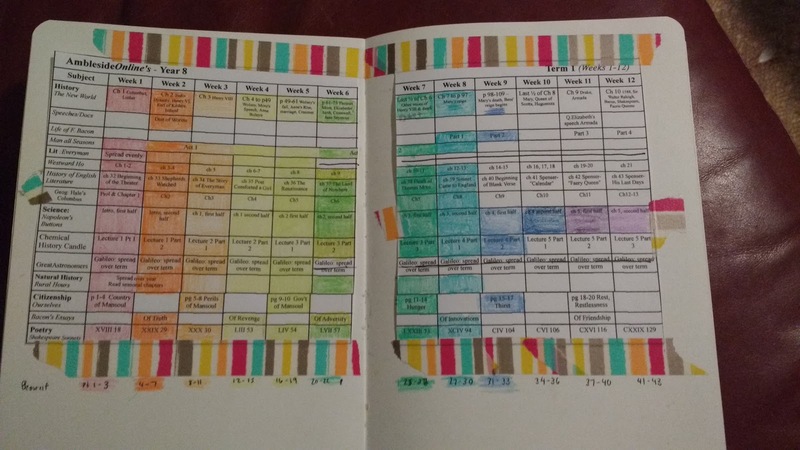 I made 4 weeks my goal for the end of February but once I was able to get going with year 8, I loved it and have sped right along. I might even have to force myself to take a break week or two in between terms to I get to some other books on my tbr pile. Year 7 was good but very challenging and required a bit of perseverence on my part which left me feeling a bit nervous about how year 8 would be because its not just a step up but I was chosing to do a larger portion of it this time. But almost every book is just catching my attention and while I have to think, it's not the struggle that I thought year 7 was at times. Even Churchill! I get to the end of a chapter and I'm like, "Oh, I finished it already?" Part of that might be the history period. Lucy also struggled with the end of year 2 and I thought it was because I had to rely on audiobooks and didn't do as much scaffolding. I'm sure that didn't help but talking to others, I've come to see that it's just a trickier section. 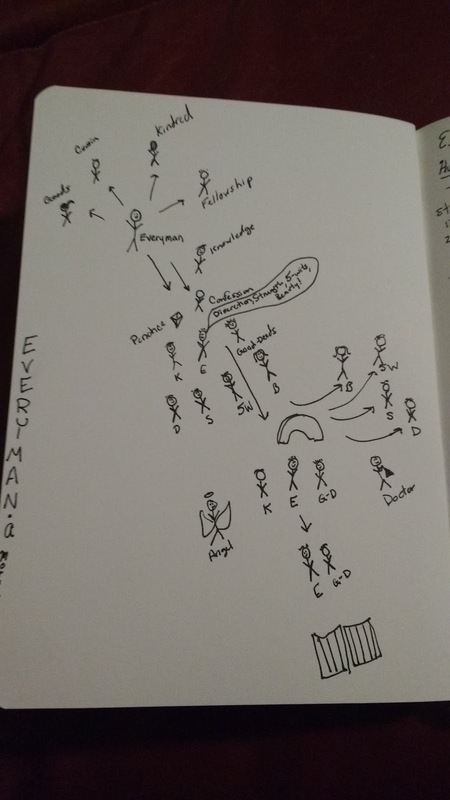 The War of the Roses has a lot of people in a short amount of time and keeping track is hard. Both she and I have enjoyed slowing down a bit when Henry VIII comes on to the scene. 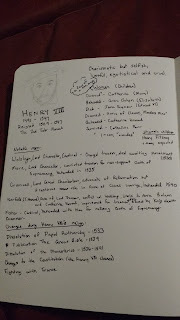 And even learning on what I had learned so far in Our Island Story, I just wasn't that familiar with early early English history. This still isn't my strongest period, my fascination with English history picks up a lot in the 18th century, but I do have a better general background to build on which helps. Or maybe I've just grown and can know more easily handle a "middle school curriculum" or I was just so desperate for some good Mother Culture after lying around for 8 weeks not being able to really do anything! Whatever the reason, I'm pleasantly surprised and enjoying my quicker pace! 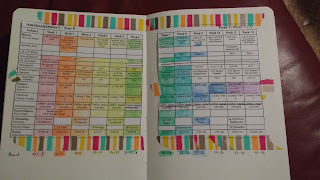 I'm also really enjoying the reading journal idea I got from Celeste. 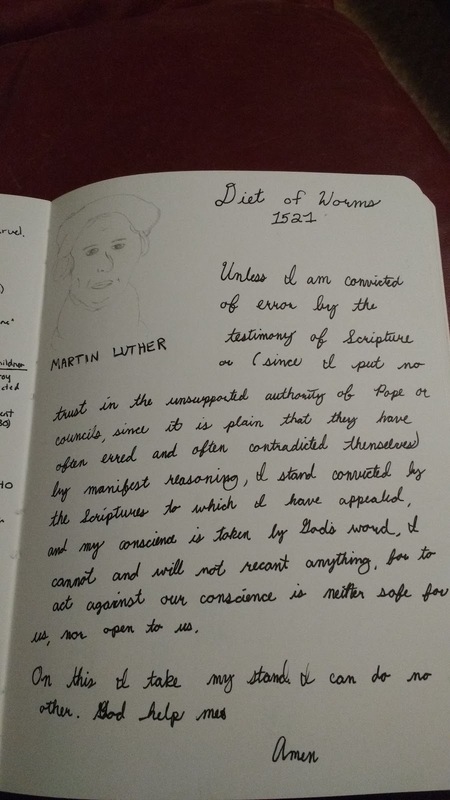 Mine isn't very pretty so don't judge my crazy drawings of Luther or Henry VIII, but I know I'm getting more out of it putting things down on paper. I need to do even more of it but here's a sampling. My century charts. 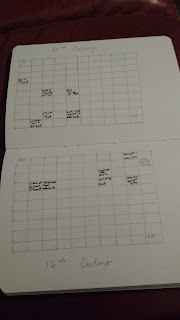 These seem lower committment than my Book of Centuries so I don't hesitate to put things down as much but I'll try to work up the courage to transfer some dates over to that when I've gotten a bit more into it. I'll talk about books I finished as I do so or I'll forget and I want to have these notes saved for when Lucy gets closer to year 7. I've also been trying to do more written narrations (for my current self's sake) and keeping them in Evernote (for my future self's sake) I didn't break up Everyman as much as maybe I should have but I felt like I read a reasonable small portion each week and it wasn't hard so I probably will assign it in a similar fashion to my students. 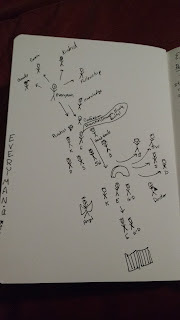 I also finished A Man for All Seasons which I enjoyed. And I'm close to finishing Napoleon's Buttons early (it's from another library so my time is limited). That's the only book I'm not sure if I will include in my own students when they hit year 8. Not because it isn't good, it is. It's just more of a history of science book than a pure science book and I'm not sure if I'll want to devote space in my curriculum to that. I might talk more about that when I finish it but I also might wait and see how I feel in a few years. I tend toward the Chemistry/Physics is it's own language and deserves it's own method in the same way math does idea. Everything else I'm chugging along with and pretty much loving. Westward Ho started out slow for me but I know by know it's me, not it. I struggle with the old school romance adventure style stories (not to be confused with the new romance bodice rippers - which I also don't read). Henty or Ivanhoe or whatever, it's just not my genre of choice but I am coming around though and I don't think I'll be dropping this one like I did the Henty book last year. Beowulf (technically a year 7 read but I switched it with Fierce Loves last year so I could stay with the AO forum discussion) is the surprise hit of the term. I'm loving it! I've actually done a written narration for every chapter so far. I knew the plot of the first 2/3 which was fine but I'm excited now because I have no idea what happens next! For the other poetry selections, I started out reading the No Fear Shakespeare Sonnets after I read the original to make sure I had an inkling of what it was supposed to be about but I've stopped because I'm fine on my own. Look at me handling all the Poetry. This won't seem as big of a deal to you unless you've been around here a while but it is! I promise I won't talk about every book but I have to include this cute little story about The History of the Candle. I'm reading each chapter and then watching the video lectures and the kids have started watching them with me. They really don't know what's happening but they like to see things explode. Jonah's even started talking in the very specific tone the presenter uses and doing experiments for me. If you watch even 30 seconds of a video you'll see what I mean about the tone. Well, today Jonah had a baggie with cheese and crackers as a snack and he stood there "You will see that I have a baggie with cheese and crackers. If the bag is closed and I squeeze it, the air moves over there and it looks similar to a balloon which you have seen before many times like at birthday parties." He's trying to be serious but it is all I can do not to laugh because he has the tone down just right. So that's about it for me so far. Next time I should have finished term 1 and be well on my way through term 2! I'll be posting the Mason for Me link-up shortly (Update: It's active now. Go check it out!) and I hope to hear that all your Mother (or Father!) culture work has been enjoyable and productive as well. Oh, one more note because I've seen a question or two about it. My plans for year 8 are just the readings. I know that a Charlotte Mason education is much more than just reading and I don't want anyone who only reads these posts to think that I don't value the hymns/folks songs/artist/composer studies/nature journalling but since we are a Charlotte Mason family, that is already including in my education because its a part of our regular school day. I couldn't escape it even if I did want to! Just today my toddler who was supposed to be napping, could be overheard singing as she lay in bed "Chicken nugget, no bone, Baby sleeping, no crying, I love you, End" (Which is this if you can't speak toddler song :-). Wow, I love this! Well done! I love your journals as well. this gives me a lot of inspiration. I decided against doing a whole year in 2018, but when me oldest starts Y7 in Jan 2019, I am going to join him. And yup, can't escape all that good stuff, even if you want to. 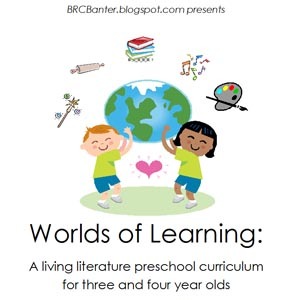 My four year old doesn't want to have anything to do with the lessons...he's the one always spotting birds, and singing our hymns and folksongs. This is great! And I had a really similar experience with the century chart -- I found it way less intimidating than the BoC, so it was a good way to ease into that kind of more formal keeping. 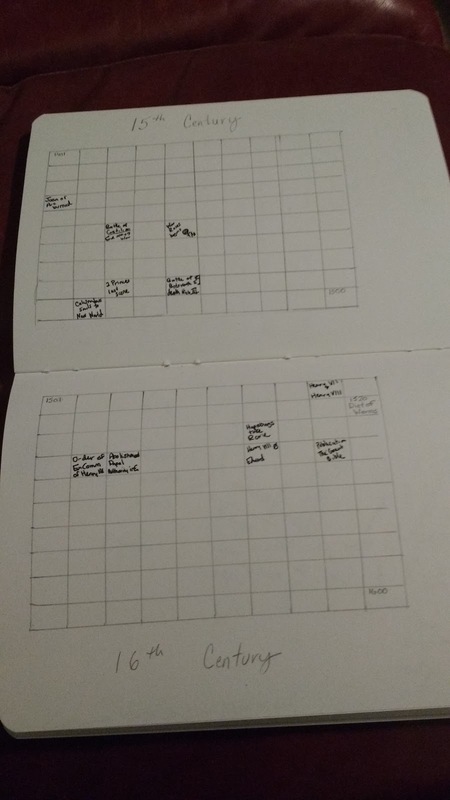 This year I'm taking on the BoC and I don't think I'd be as ready if I hadn't done the century charts first! 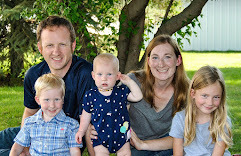 My kids seem to feel the same about it, as they've taken the same trajectory. Excellent! 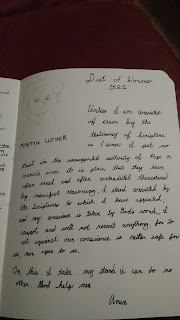 I like the reading journal. My daughter is Year 8 and the books are great, however, I can't seem to get around to reading them all or even close.